If you have an iPhone, iPad, or iPod, you can remotely wipe the device with the help of an excellent free service offered through iCloud called “Find My iPhone” (or Find My iPad, etc). This is perfect for situations where a lost device is long gone with no chance of recovery, because it erases anything that is personally identifying, be it emails, texts, contacts, apps, quite literally everything. If you don’t have this configured yet and you don’t know how to use it, set aside some time to learn, it only takes a few minutes. Yes, the app is called Find My iPhone even if you’re using it to find an iPad, iPod, or Mac. We’re going to operate under the assumption that you already have iCloud configured properly, and that the Find My service is enabled. If not refer to the links in the requirements section and get that configured. This can not be undone, keep that in mind before beginning. That’s it, the lost iOS device will now be completely wiped free, erasing all personal data that it contained and leaving no trace of you as the original owner. The device at this point is effectively reset to factory defaults from afar. 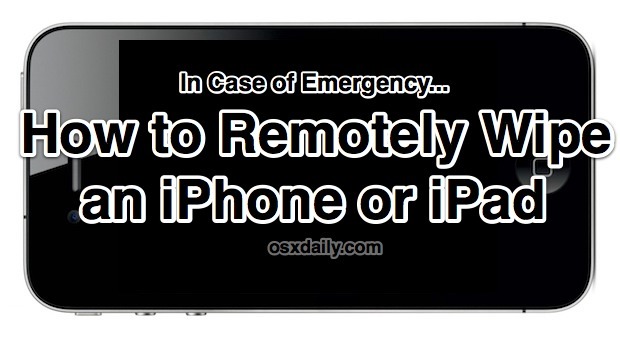 Because Remote Wipe causes the iPhone, iPad, or iPod to no longer appear in Find My iPhone, it should be considered a last resort when you are absolutely certain you won’t get the iPad or iPhone back due to theft, loss, or some other situation. An alternative if you still want to track the device is to use “Remote Lock” instead, which locks the device down though it does not delete sensitive data from the device. If you have a Mac or two setup with iCloud and Find My Mac you’ll find that you can remotely wipe a Mac using the same method. It’s better than nothing — but for wi-fi only devices (like iPod or iPad with no 3G), it seems you are in a catch-22 to use this in that you’d have to configure it to automatically join any unsecured wifi network or hope that it is lost only in areas where you’ve already configured it to connect to a ‘known’ wifi network. If you’re really wanting to protect your device, you’d also need to configure it to have a complex passcode and set it to auto wipe after 10 failed logins. I’m not so sure on the Delete Data function after 10 failed passcode attempts. Surely if the phone is stolen the thief can just keep trying passcodes (within a matter of seconds) until auto wipe is activated and then you can no longer us the Find My iPhone App to actually trace your phone and voila, the thief has a clean iPhone. I’d rather try Find my Phone first to get my phone back and then remotely enable Data Delete as a real last resort. If someone goes through iCloud to wipe the phone to factory default, does iCloud keep a record or log of that being done? Can I pull up the log to verify it was done remotely? Is there a notification that a wipe was performed? The good news is that my friend gave me his iPhone 3G. The bad news is that Apple won’t allow iCloud to run on it. Are there any other remote wipes solutions? How can you cancel this feature ? Is there anyway I can cancel remote lock and remote wipe for my Macbook pro ? I just can’t sit with the thought that if someone hacked my apple id, then my macbook pro would lose all the data it had .. I was wondering if there is anyway that we can get our information back on the iphone once it is wiped clean. We erased the information by mistake. Now my husband has lost all of his valuable pictures, texts and some of his contacts. I assumed that it was saved to icloud on the computer. When we plugged the phone back into our itunes account it did reload his cellular phone number but not all of the important data. Can someone please help? Thanks so much! Can anyone tell me if you can track the phone that wiped your phone? This is important and I need an answer ASAP!!! maybe dont get your phone and yourself involed in illegal activity? that help? wont try or lie to you to try and bully you to let them in as it is much easier way to do. Hope your got caught for whatever it was you did. It’s funny how people put everything on their phone, good or bad, then get concerned when they get their phones confiscated. Don’t do stupid stuff then you have no worries. If you do stupid or illegal stuff, don’t record it on you phone or any other device and don’t be a complete jack-hole and post it online to youtube or any other social media site. Fifth amendment anyone? Oh well… I can’t believe that wasn’t the first thing said. Don’t surrender your rights to the government ever. Police may need a warrant to search a cell phone. Parents and schools or their officials do not have the same requirements that police do. Passlock your phone (or fingerprint) and refuse to open it. I’m not supporting illegal activity, but I am for requiring people to get warrants for searches as is stated in the constitution. does erasing your iphone on find my iphone, erase your apps as well? and i was wondering what content did it erase! Apps are deleted but are always restorable in iTunes or iCloud at the very least. Not all free apps are restored if you did not back up, but any purchased ones can be without charge. But if it was free app, they are always downloadable again. hi i got a new iphone 6s a few weeks ago, loaded all my photos and linked my email, then returned it! i didnt have icloud set up on it so i cant remotely delete through find my phone. is there another way to disconnect the email at least? thank you. I am trying to erase my iPhone, I have forgotten the passcode. It stops at Erase pending, how can I make it pass this stage. guys how can may iphone be located or trace by using find my iphone if it is locked?i min it is disable.the wifi and location services is disable before i forgot the passcode..need help guys please.. Simple deletion can’t completely erase the data from iPhone, they still remain on your iPhone’s internal memory and easily be recovered. 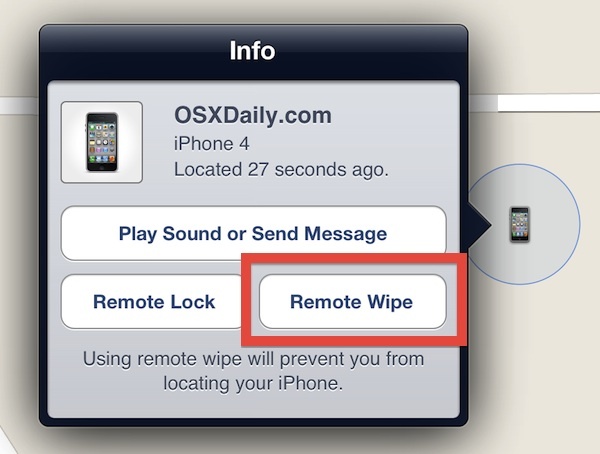 To permanently wipe your iPhone content and settings, I suggest try Safewiper for iOS to wipe your iPhone. So my phone randomly went in to activation lock and I have no idea of the iCloud I used or password I have tried re setting it but I have forgot everything as I always made up one that wasn’t my actual email I have phoned apple and because I’m nt sure of all my security question they can’t erase the account for me to go on my phone is there anyway I can get this done at all ? Is there any other way of wiping the phone out. Or can you only do it through find my iPhone? What if the phone is completely disabled and can not connect to the internet? The erase would just be pending. Correct? That’s correct, if the iPhone is disabled and not online, or if it never gets online (prevented from online access or otherwise), it could not be erased this way because the request would not be complete. 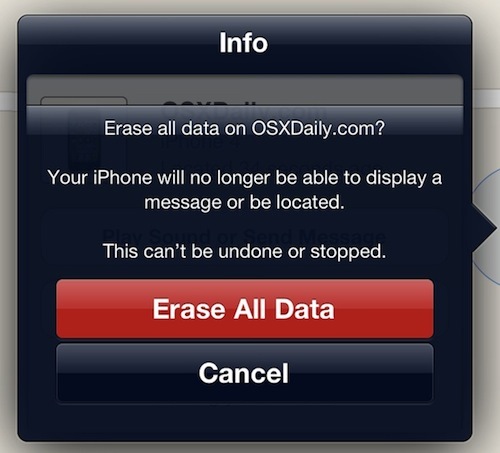 The erase and wipe request to an iPhone or iPad requires iCloud and internet access.